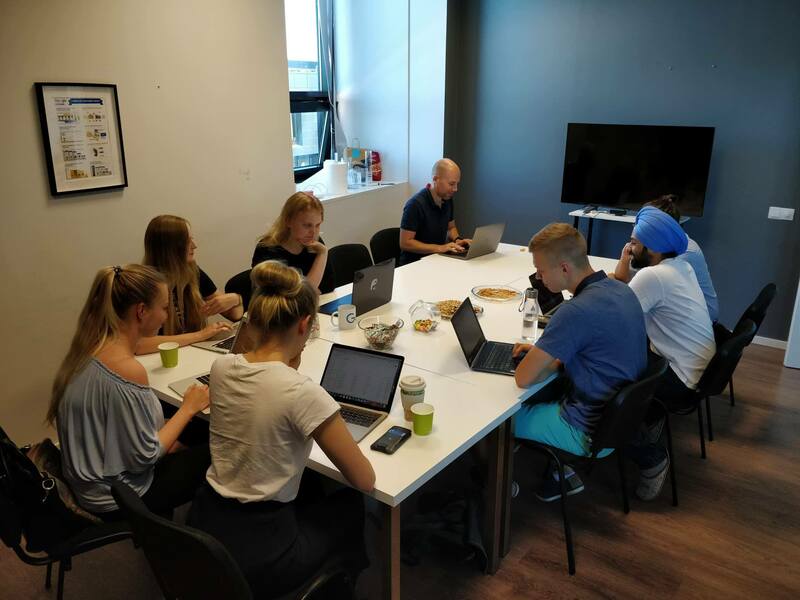 In the summer of 2018, for the second year in a row, ePPC decided to open their doors to digital marketing newbies and teach them all the basics over a sunny 6-week period from July 16th till the 24th of August. If you are interested in how it all happened and just how many things you need to learn to even consider yourself a beginner in the online paid advertising world, keep on reading. Over 100 hopeful young people from very different backgrounds applied. The academy began with 7 of us, including two business students, an IT student, a PR student, an anthropologist, an economics major and one engineering student with a heavy focus in data science – a truly mixed lot. But we had one thing in common – essentially everyone was starting from scratch in the digital marketing realm. The Summer Academy had two parts, 2 weeks for the theoretical training and 4 weeks for a practical internship. The first two more theoretical weeks were organised so that on Monday, Wednesday and Friday, we gathered together from 10 till 5 in the evening to listen to presentations and try to understand the material together. Tuesdays and Thursdays were left for independent study and taking different Google exams. As two of the participants were not from Estonia (thanks to AP and Bruno, we were lucky to have an Indian and Brazilian perspective to all our discussions), all of the trainings were held in English. Our first day together started with some rather sweaty introductions, a result of collective excitement and the ongoing heat wave combined. The trainings were mostly conducted by Karl, the founder of ePPC. He started everything off with some encouragement and a motivational story about learning to swim to get us through the sea of information that was about to hit us. What followed were thorough presentations about all the fundamentals of Google Ads and all the different types of ads that were at our disposal as of July 2018 – there are more than you think. The most common but ever evolving search ad type took a good chunk of our time to understand.We learned how to find keywords, what kind of keywords and match types to choose, how many of them to use in one campaign. Also, how to organize them, and most importantly, how to evaluate their performance and optimize to make everybody happy. We launched our own first test campaigns and realized very quickly that looking at slides and taking tests is completely different from being in charge of actually creating a decent campaign, even if it’s a fake one at first. Different types of display ads (including the ones you see, when using mobile apps) and Youtube ads also have a lot of nuances to keep in mind. For example, if you are not using specific targeting and exclusions, you are most likely losing half or more of your impressions to bots and another big chunk to scammy websites. This is why remarketing display ads are currently the best bet that actual people who might be interested in your service will see the ads you are paying for. During the second week of filling our brains with valuable new information, we dove right into the world of Google Analytics. We were quite amazed at just how much it is possible to track nowadays, but even more surprised about how many things can go wrong when setting up all of these complicated tracking systems. As we learned, sorting out tracking issues is a huge part of the job of running successful campaigns. As important as tracking is when it comes data, making sense of the results after you have been measuring for a while is an even bigger challenge. Building dashboards and reports that don’t “data puke” and not measuring just for the sake of measuring are big challenges for beginners and more experienced marketers alike. After getting a grasp on one of the most complicated parts of our academy curriculum, it was time for a nice and relaxing team event. 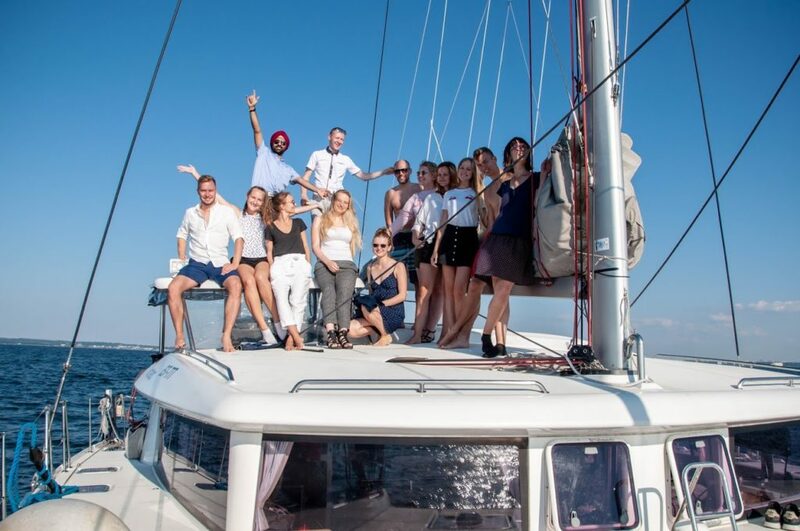 And what better place to organize a team event for a team that works right by the port in the middle of a hot summer – oh yes, we went on boat trip. For one glorious afternoon in perfect weather, we sunbathed and hung out on the catamaran “Nordea” (the same one that took the well-known Estonian musician Jaan Tätte literally around the world), quietly cruising around the Tallinn Bay. The second week curriculum also gave us an intro to Facebook ads by our in-house Facebook specialists Ann and Reimo. We also got a great overview of Bing ads by a presenter from Microsoft via Skype. This actually changed a lot of minds about whether or not advertising with Bing would make sense. We also learned what are the differences with Google Ads to keep in mind. Another very interesting and practical training we participated in during that week was about teamwork from Mats Soomre at KoostööKunstiKool Belbin. We all took a self-evaluation to find out what type of team roles suit us the best and talked through what type of tasks would make sense for each of us to make working together as smooth and efficient as possible. During the end of the week we started to go over optimizing campaigns in more detail, but everyone was already feeling very excited to start putting things into practice to understand what we were actually being taught. In the beginning of week 3, we had the last of the theoretical presentations. We had a local Google Support representative talk us through what kind of things their teams can support us with. We also went through some more practical training about how to handle customer communication and what kind of productivity tools the ePPC team uses to work smarter. Finally we had Facebook expert James York talk to us about different stages of the marketing funnel and how to strategize according to which part you want to focus on. Optimizing skills are something you can truly acquire with practice, and most of the things we had discussed earlier only started making sense once we were working on real accounts. We had a bunch of different materials and recommendations to guide us, but really, every account has its own needs and special circumstances. Although some aspects of optimizing are becoming more easily automated every day, this is one part of the job that boils down to experience.As many of the team members at ePPC expressed, it takes time and persistence to start to understand this hugely complicated system in order to feel confident with every decision. After all was said and done, all of the participants felt very appreciative about their experience. The trainings were centered around concentrated knowledge about what really matters when doing digital performance marketing for real businesses and felt very practical. Speaking of feelings, the free and relaxed atmosphere and flat hierarchy in the office made everyone feel at ease to ask questions and get to know everyone right from the start. The flexibility of the internship working hours and the type of work we wanted to focus on was also something everyone was very grateful for. 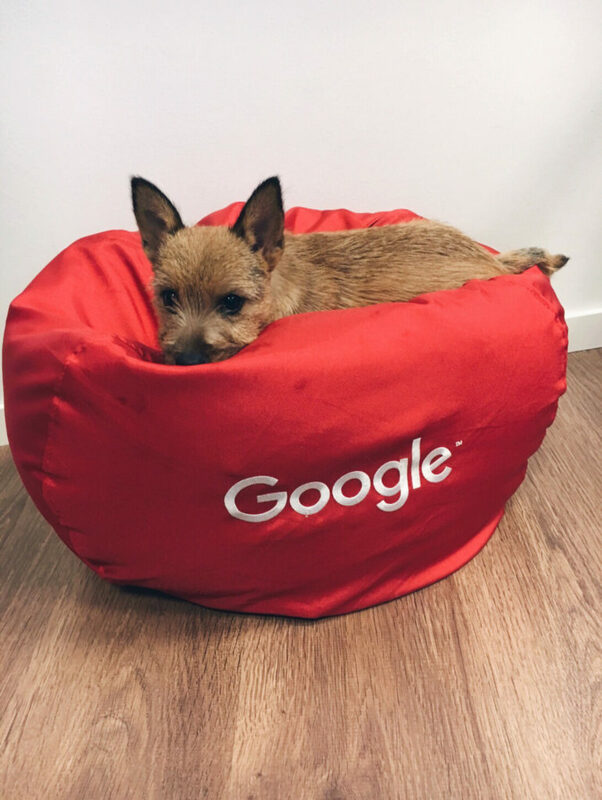 And when the numbers didn’t seem to make any sense and the spreadsheets were becoming overwhelming, the office puppy Nacho helped everyone chill out and take a well-deserved break. Even though in the end, we were still newbies, thanks to the Summer Academy, we had some understanding what it means to actually work in digital marketing and how much more we can still learn.